More than 50 delegates from 15 countries across the globe convened in Kigali, yesterday, as the Africa edition of broadband forum opened to share real-world practices and examples to overcome obstacles to developing internet access. The three-day Africa Broadband and Universal Service Forum brings together government officials, captains of industry and members of the civil society from around the continent, with a special focus on the broadband implementation plan in various African countries, as well as challenges and solutions to obstacles in programme development, implementation and operations. The forum is hosted by the Ministry of Youth and ICT (MYICT) in collaboration with Intel, a world leader in computing devices microprocessors. Jean Philbert Nsengimana, the minister for youth and ICT, said the forum is critical to the country’s aspirations of ensuring that Rwandans have access to broadband and would use the opportunity to expedite development. “We are excited to host this conference; we see this as an opportunity to provide a platform for fellow African countries to explore ways of fast-tracking deployments across the continent, sharing best practices and engaging industry experts,” Nsengimana said. According to the minister, most Rwandans don’t have skills to use digital devices they have and said that the government has committed to build capacities alongside the connectivity. “Over 50 per cent of the population use mobile phones which can access the internet, but only 30 per cent of them use the fortune put in their hands. So, as we take broadband to every corner of the country, we shall also be providing skills on the use,” Nsengimana said. He said ICT will soon be speeding up the country’s development at a rate unimaginable because Rwanda is among the largest broadband adopters on the continent. Ralph Corey, the director of Intel World Ahead Programme, shared the concerns over the poor skills on use of digital devices. “Broadband is not only about having physical connectivity but also knowing what to do with that access. We want people we connect to be ICT literate, to know what to do with the broadband,” Corey said. He said his organisation would embark on imparting ICT skills to the youth in schools, and will empower them with ICT-based entrepreneurial skills. Organisers of the forum said it will combine an interactive environment with a special focus on how governments can implement plans to enhance the socio-economic benefits that internet provision services can provide for the continent’s citizens. Didier Nkurikiyimfura, the director-general of ICT in the ministry, said that broadband is expected to increase the county’s connectivity to the rest of the world, access to international market and sell services. Nkurikiyimfura said outside of Kigali, only four cities; Musanze, Rubavu, Rusizi and Huye, are connected to 4G LTE Internet but the entire country will be connected by 2017. Nkurikiyimfura noted that the number of subscribers to 4G LTE internet is highly increasing and a special increase is expected as the three telecommunication firms signed contracts with 4G service provider. “Within six months since the launch of 4G LTE Internet, there has been a big increase in subscribers from day to day, but now that MTN, Tigo, and Airtel have contracted with the service provider, many of their customers will be soon using the facility,” he said. A further reduction on the 4G LTE internet prices is expected after a drop from Rwf4,100 to Rwf1,300, per gigabyte, three months ago. 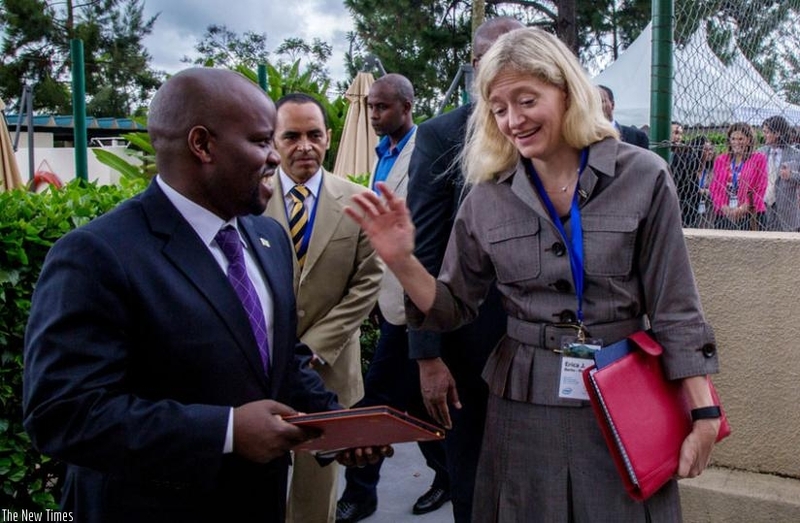 Rwanda is the fourth African country to host the event after Kenya, Tanzania and South Africa.